The Old Boys’ Association, founded in 1917, furthers the development interests of the School while providing a forum for old boys to remain connected. The Association hosts a range of old boy events throughout the year. The Association is an independent organisation, administered by a committee of old boys who are elected on an annual basis. The committee is responsible for the running of the Association and the achievement of its objectives. 13,500 students have passed through Christ Church Grammar School since its beginnings in 1910. Currently we are in touch with 9,075 old boys on our subscription list including 6,150 life members. To encourage social interaction between its members. 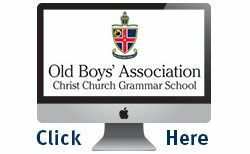 To apply for membership to the Old Boys’ Association, download an OBA Application for Life Membership or contact the Alumni Office to have a form posted to you. Click here to view past and current editions of the Old Boys’ Newsletter.